The Soviet Union watched as the USAF started developing a new generation of close air support (CAS) aircraft under the AX program. Two contenders emerged - the Northrop A-9 and the Fairchild A-10. Of course the A-10 with its tank-busting 30mm GAU-8 Avenger gun would win the AX program and serve with distinction through numerous conflicts. When the Sukhoi OKB (design bureau) developed its own concept for a CAS fighter, it ironically resembled the Northrop A-9. Powered by a pair of non-afterburning R13-300 engines (same engine core as the MiG-21), the Su-25 was armed with its own twin-barrel 30mm gun and ten underwing pylons for weapons and external fuel. The aircraft was codenamed Frogfoot by NATO. Designed to counter the combined forces of NATO, the Su-25 instead received its baptism of fire over Afghanistan. 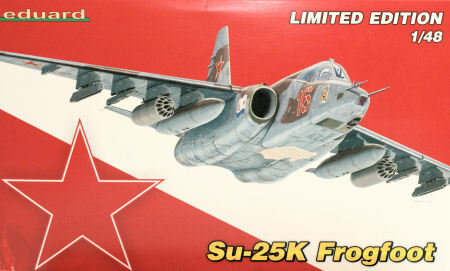 Even in these harsh operating conditions, the Su-25 functioned well in the CAS role, though at that time, it was not adequately equipped with infrared countermeasures to counter the shoulder-fired Stinger SAM missile. Like many other aircraft that fell prey to the Stinger, Su-25 crews applied field modifications and employed hard-learned defensive tactics to support the troops on the ground. Kopro (also known as KP) is a Czech-based model company that produces a variety of kit subjects in 1/72, plus a few noteworthy subjects (Su-7, Su-17/22, Su-25, MiG-21) in 1/48 scale. 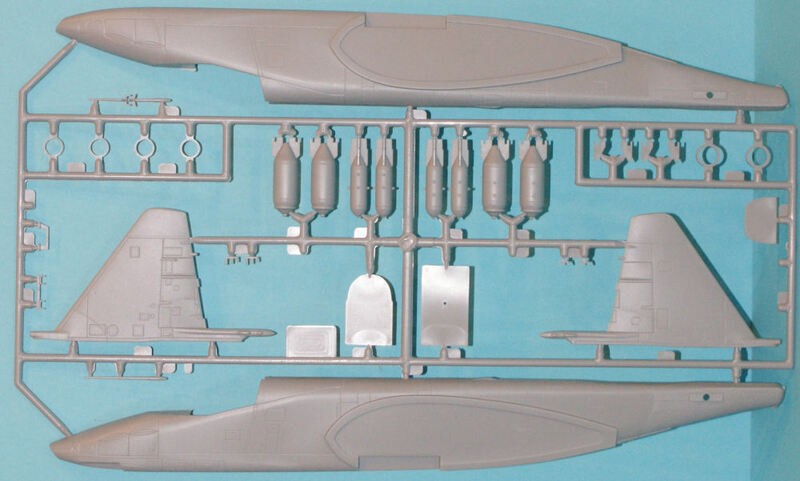 Kopro produces the only injection-molded kits of the Su-25 series in 1/48 scale (Monogram's kit represents an early prototype of the Su-25, not an operational machine). Eduard has released this Kopro kit as one of their limited editions which takes the stock Kopro kit and adds some aftermarket details in this one box. Molded in light gray styrene, the kit is presented on five parts trees and a single tree of clear parts. The detail and layout of this model is not unlike a Monogram kit. The details on the surfaces are scribed. There is no hint of flash or sink marks. Eduard includes one fret of color-printed photo-etched parts primarily for the cockpit and another set of photo-etched details for other airframe enhancements. This release is rounded out with some resin details including a BrassIn K-36D ejection seat. The stock Kopro kit is still the best Su-25 in any scale (though the Trumpeter 1/32 Frogfoot is coming soon) and for the most part, is fairly accurate. Some of the weapons in the kit, especially the R-60s (AA-8 Aphids) need to be replaced, but there is definitely an excellent assortment of external tanks, gun pods, rockets, bombs, and missiles to fill up those pylons. The Eduard update has the dual frets of photo-etch (one in color), one set of canopy masks, and some resin parts to enhance the stock kit. Unlike some of the previous Eduard special releases though, this kit does not have a replacement resin cockpit. The color photo-etch provides a replacement instrument panel. but you're on your own for the side consoles. The color photo-etch fret has the intricate shoulder harness of the K-36D. The photo-etch also provides details for the new resin nose wheel splash guard, heads-up display, overhead shield, grab handles, pitch and yaw sensors for the pitot boom, and a nice boarding ladder. While the resin set doesn't touch the cockpit (aside from the ejection seat), it does provide cooling scoops, the nose wheel splash guard, and the Afghan war chaff/flare launchers. 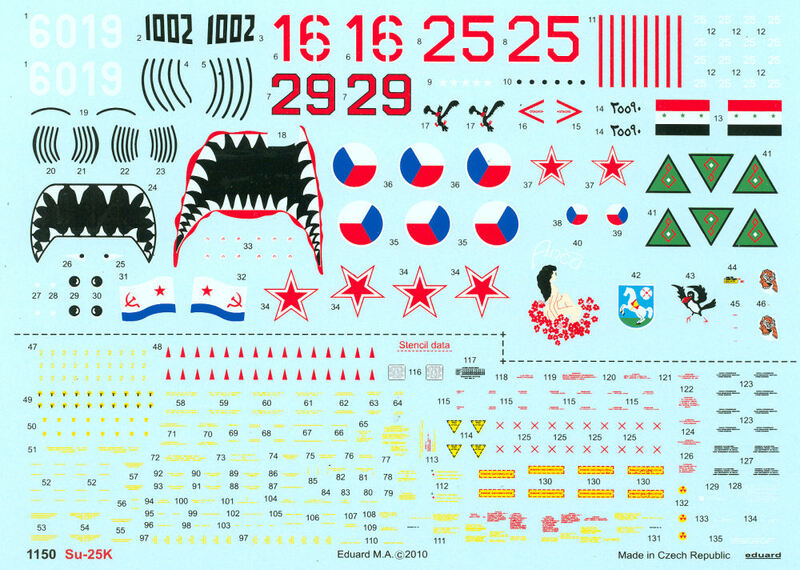 An extensive set of stencils is also provided for the airframe. This is a nice kit that can be turned into a really sharp model. The additional parts that Eduard provides in this kit are fair enhancements, though I wish they'd tackled the cockpit in resin as they had in other subjects. The stock Kopro release is still available overseas for about $35 USD and bargains can be had on eBay and at kit swaps.